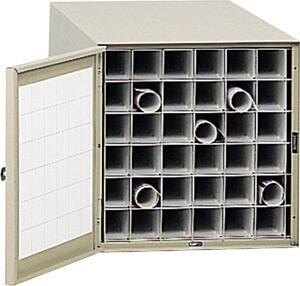 Furniture-quality cabinet with heavy steel construction and anti-racking design. Stackable for high volume storage. Thirty-six square fiberboard tubes are reinforced with aluminum molding. Reversible door for left or right opening. Includes a label grid for easy identification of contents. Tropic Sand finish. Shipped assembled. Dimensions: 15 1/4" Width x 38 Deep x 15 1/4" Height.